Dr. AL-Dulaimi obtained his MBChB with postgraduate training from Iraq. He then moved to the UK and completed his training in dermatology and worked as a consultant, since 2008. He worked in different hospitals in the UK; Barnet and Chase Farm hospitals, Basildon University hospital, Southend Hospital, Medway Hospital, Royal Berkshire Hospital and Nottingham Teaching Hospital and the last two years at Mediclinic Hospitals/ AL-Noor Hospitals. 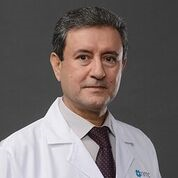 Dr. AL-Dulaimi completed part of his training in dermatology and dermatopathology at St. John’s Institute of Dermatology, King’s College Hospital, London and skin allergy at University of Southampton. His training in skin surgery and cosmetic were at San Diego School of Medicine USA and the American Academy of Aesthetic Medicine. Skin surgery: excision and skin biopsy with various diagnostic and therapeutic procedures, e.g. ; cryotherapy and cautery varicose veins. Cosmetic: laser, for hair removal, rejuvenation, skin tightening, wrinkles. Radiofrequency for wrinkles and rejuvenation. Chemical peeling and fillers. Management of various types of skin allergies. Treatment of diseases of skin color e.g. ; vitiligo, melasma, freckles, and skin pigmentation. Management of all skin problems in children and adults including benign and malignant skin tumors.